That night we didn’t sleep so much. Hynek persuaded us not to sleep. Why? He promised us beautiful sunset over Torshavn. At 3 o’ clock morning we had to leave Viking club, because they wanted to close it. We spend rest of time, speaking, near of Viking club. We were so tired. From our group was everybody sleeping except Hilda and me. We were looking forward for a beautiful view. But later we moved to restaurant on the lower deck. There slept other people. Possibly there were better place for sleeping than in the couchets. 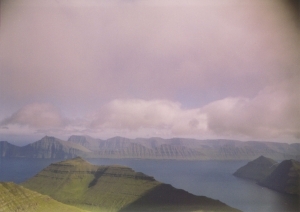 We were near of Faroe Island. On the chilly deck, searching sun rays from incoming sun, we finally understood, that we had bad luck. The fog around us was so strong and it was impossible to see some sun, neither made some good photo. We went to sleep and we slept till afternoon. After afternoon shower we were still so tired. At evening it started to rain, and strong wind moved 5 metres high waves over the deck. Group of young people from north surprised us. One of them in the good mood went to Viking club in the life jacket and he had fire extinguisher on his back. The crew of ship weren’t enjoyed with his manners and they disarmed him shortly. Norrona in the storm was waving from one side to another. We were looking on the movie, but sometimes it was so difficult to do it. Also Faerian musicians had problems to play and they gave it up in short time. But it didn’t matter us. We persuaded the waitress to play our tape with Slovak well known group, Elan. It helped usand we were dancing about hour. In good mood we went to sleep, knowing, that we have to reach Hanstholm at morning. We had to rest before long trip in the bus to Slovakia. Nice post. Its really nice.